At the beginning of developing/exploring one’s psi related, students are unsure that what they are doing is “real” and what it is exactly they are trying to do when they practice. Crippling doubt seems to be fundamental to process for most people. Many teachers and authors use the words “pretend”, “made up”, things like that. I think it’s done to allay anxiety and fear, but it has the opposite effect for me. It makes me uneasy and reinforces my doubt. Assertions that it will work ring hollow without a mechanism of why this might work. These doubts then make it hard to settle in, focus, and feel confident that I’m doing something that will lead me somewhere I want to go. I suspect at least some others feel similarly. I think this is a hard problem to work your way around even with constant reassurance. So here is a possible way of explaining it. Consider asking a room filled with 5 year old children to create a picture of a house. You give them all the same picture and ask them to copy it and you hand them all the art supplies they want – glitter, macaroni, pencils, water colors, finger paints, colored paper, everything. You will get an amazing array of results, every single one of which will be seriously flawed in terms of accurately reproducing the picture. Objects will be missing, the colors incorrect, windows missing. Objects will be present that weren’t in the original picture. Some children will draw their dog in front of the house even the picture clearly doesn’t have a dog. Nothing will be to scale. Now perform the same exercise with a group of 55 year old career graphic illustrators giving them each a comprehensive set of pencil lead drawing instruments. You would get back precise, complete, accurate representations of the picture. Interestingly though, despite using the same equipment and having years of the same kinds of experiences and training they will not be identical. Each person will use shading a bit differently and lines will be thicker or thinner. These different techniques will yield significant differences, but each drawing will clearly represent the picture accurately, completely and without superfluous information. So, we, as novices, are simply at the 5 year old stage. We have a hard time even focusing long enough to remember what we were supposed to do in the first place. We don’t know which tool to use or even how – glitter, colored pencil, crayon? We end up getting glue in our hair and spilling glitter all over our classmate’s desk. We can’t draw lines well at all. We can’t control our hands because we haven’t practiced – our neurons and muscles just aren’t there yet – we must fumble around to help them develop. It is clear we will need to spill a lot of glitter and get marker on our face while we figure out how these tools work. We must do this before we can even try to represent anything with accuracy. We lack discipline and must cultivate concentration and focus. We keep thinking of our dog or older brother or ice cream trucks, so we draw them in there when they shouldn’t be. As we practice though, we move in the direction of the accomplished graphic artist who correctly filters out these distractions and knows how to use the tools and which tool to use for the given situation. Fortunately, we don’t have to be at this advanced stage of development to do something important and feel like we are progressing. Even the 5 year old will capture some of the essence of the picture. Maybe it’s just the color of the roof, or the fact the house has a door on the left. Maybe it’s not even the house itself we portray, which was supposed to be the focus, but it’s the tree adjacent to the house that caught our 5 year old mentality and skill level. Regardless of how distorted and incomplete our final picture though, it will represent some aspect that is recognizable in the original picture. Something that is important. With practice, more of the essence will be found in the result and it will have greater accuracy and happen with less difficulty. So, the pretending we do as we start out isn’t so much pretending as it is experimenting with glitter, finger paint, colored pencils and seeing how to simply use them From these very basic building blocks much more complex, accurate results can be made. It is important to recognize that not everyone can become the skilled graphic artist, capable of turning a sheet of paper and pencil into an almost photorealistic image. In fact very few of us are like M.C. 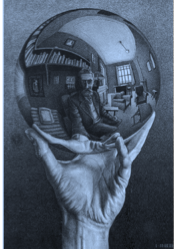 Escher, an artist who could do this. That’s okay. His work is perfect. Some people want exactly this, but others will find it hollow and wanting. Maybe Escher fails to capture something important by representing the object so accurately. Consider Monet by contrast. Some people find they can only use oil paint and can’t draw precisely. They should not despair. Embrace it and capitalize on it. 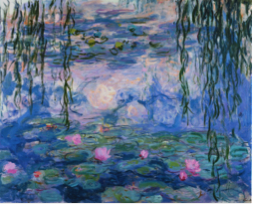 Monet did this when creating his works like the Water Lilies series. Escher is perfect, but one could argue Monet conveys more about what is important than anything Escher would have drawn. Other people have even less ability to precisely transcribe what they see. Van Gogh’s Starry Night fails to represent a night with stars with any degree of accuracy, yet it conveys tremendously valuable information. It is without question a beautiful, emotive starry night. 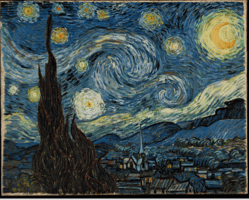 It conveys Van Gogh’s personality while at the same time a chilly, star filled sky at night. No photograph can do this as well as Van Gogh’s terribly inaccurate representation of a night sky. 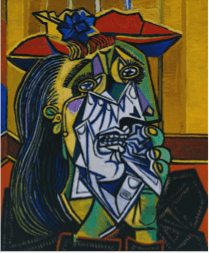 Maybe your skill renders abstract results like the works of Picasso. You see multiple facets of the same thing all mashed together each from a different perspective simultaneously. If so, what an impressive gift. This is not a photorealistic rendering, but it conveys a tremendous amount of information. Again, in some ways it is more interesting and more complete, conveying certain kinds of information better than a photorealistic drawing ever could. 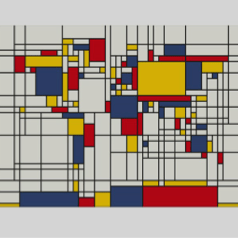 Finally, others may have to rely on pure abstractions of straight lines and solid colors like Kandinsky or Mondrian. Again these are – at least to some people – impressive, valuable creations conveying emotion, movement, and sentiment. How can unshaded, regular lines and solid colors make you feel agitated, sad, busy, or excited? But they do for many people. Even if you don’t like them, they have in fact already moved you. Ask yourself why? This is a hard question to answer thoughtfully. Hmmm…maybe there is more to them than at first it may appear. For some people they capture information better than any photograph ever could, possibly by distilling to its very essence that which was most important at the moment for the artist. Maybe you end up being a straight line and colored block person, but that doesn’t mean you aren’t perceiving something important. At this end of the spectrum the object the artist may be using as inspiration is unrecognizable as that particular object, but the way it is rendered still brings forth important information about it. So, I guess the moral is that you must play with the glitter. Get the glue in your hair. Smear marker on your nose and fingers. As an adult, this may make you feel like an incompetent fool. But you’re not an adult in this context. Here, you are just a normal 5 year old playing during crafts time in school. So, it’s okay. That is what crafts time is for; to learn these skills. Keep at it, grow, and see which style you end up painting. As you do this, you will learn how you can convey your particular understanding of what you perceive. 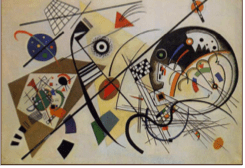 You may be an Escher, Picasso, Kandinsky, or something else entirely. Regardless, you will be able to capture something important and convey it in some meaningful way.